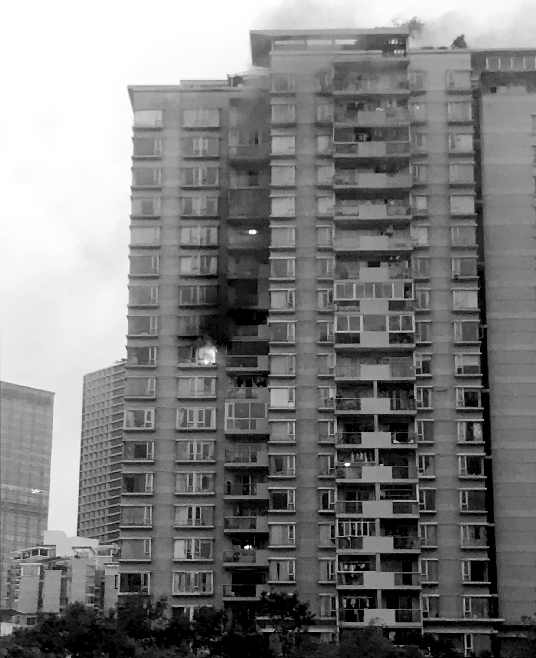 Black smoke is seen billowing from an apartment in a building at the Le Parc housing estate in Futian District yesterday. The fire started at about 5 p.m. in the study of the apartment and quickly spread to the whole flat. The two people who were living in the apartment were out for dinner when the blaze broke out. They said there were a computer and an air-conditioner in the study and the fire might have been caused by an electric appliance. No casualties were reported in the fire, which was quickly put out by firefighters. Two employees of the property management were slightly injured while trying to put out the fire. They were later taken to the hospital for treatment.